First on the list was to find condoms. Since we were shooting in an abandoned farmhouse with no store nearby, I had to beg the crew guys for the condoms they were carrying in their wallets. Awkward! 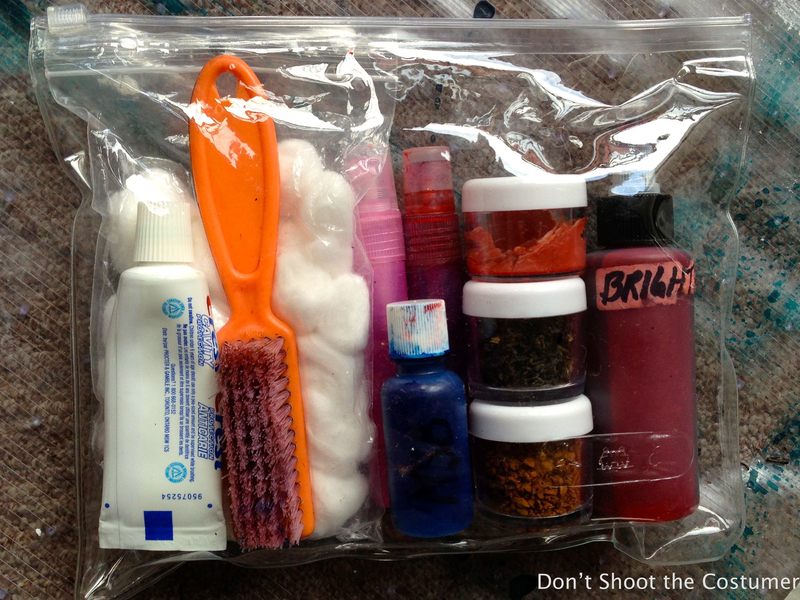 Then, with the crafty girl’s help, I filled the condoms up with dish soap and red food coloring. 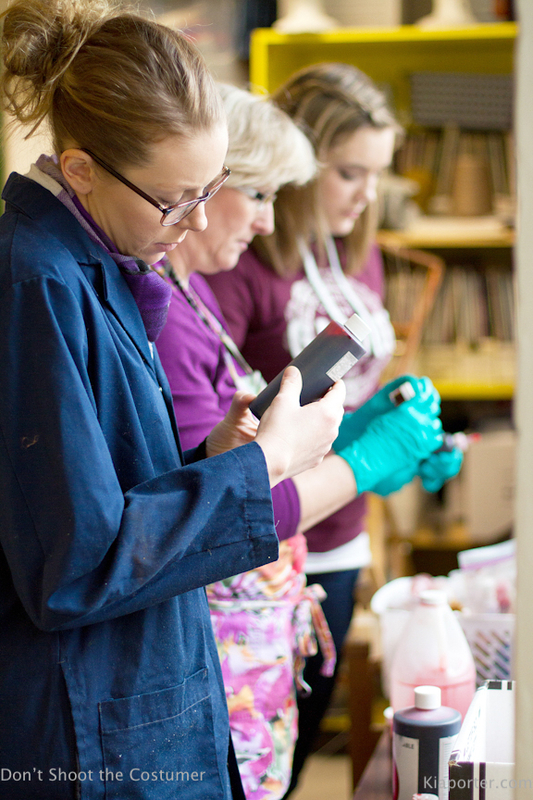 Presto… the blood bags were ready to go! We were ready for the scene. I taped the blood filled condom to the actor’s chest… the director yelled action… and our lead actor stabbed away madly. The condom didn’t break… surprising? What nobody knew is that the condom needed to be weakened… ah important detail. I made a few quick holes and the condom broke on the next take. The blood was overly bubbly, but I was very happy to have that scene over! Crazy way to start, but what that experience taught me was to never be afraid to ask for help… and always find the courage to try. 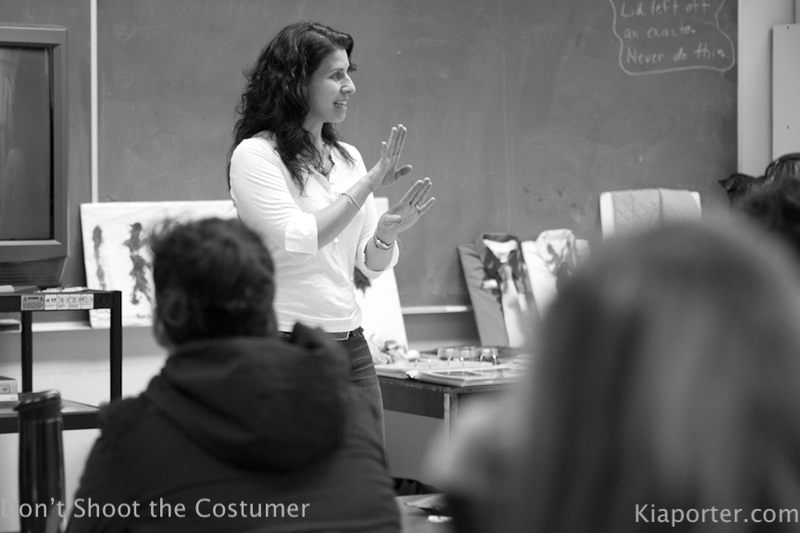 Over the last ten years I’ve hosted classes for new costumers at IATSE in Vancouver, SMPIA in Saskatchewan and the Costuming program at Capilano University about the artistry of working with film blood. During the classes I show a collection of video clips that highlight the different ways blood can be used to create emotion and impact in the movies. As we go through the different clips we discuss using blood rigs, blood pumps, bullet hits and the types of blood used with them. We also look at how blood colors can add or detract from a scene and how to manipulate the costume pieces to help create different effects. But the real fun of the day is just getting sticky and playing with it. 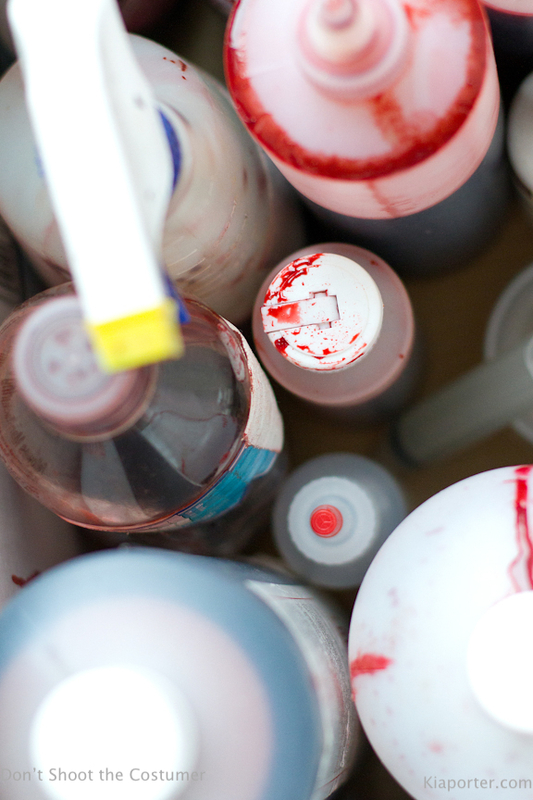 We are fortunate to have so many varieties of on-camera bloods available on the market. There are choices of bright, standard and dark colors, and runny, sticky, thick and drying textures. There is also washable blood, edible (yes, edible!) 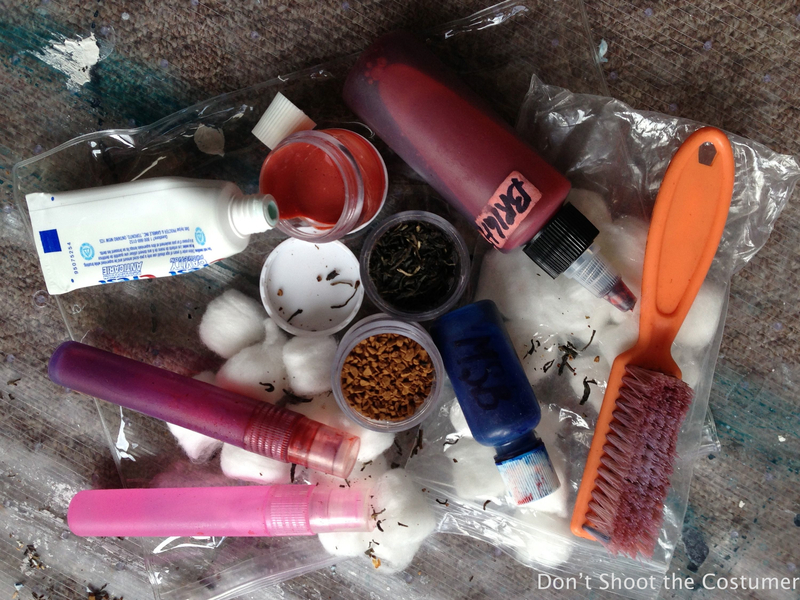 and powdered bloods that we can just add water to… and don’t forget the gels and sprays! It’s fabulous to be able to do a little trial and error with the different bloods on a variety of fabrics in a relaxed environment… instead of on an outrageously expensive, one-of-a-kind costume with the entire crew looking on waiting to shoot. This year I asked Kia Porter, a good friend, fellow costumer and photographer to join us for the Cap U class and take photos during the bloody mayhem! She took one of my very first blood classes and it was wonderful to have her there again after a decade of life and costuming. 🙂 Click here to see the photos. Working on so many film sets, some in other countries, I’ve been incredibly lucky to befriend many new costumers and makeup artists. The great thing about this is that they’re often using new or different products to what I have. 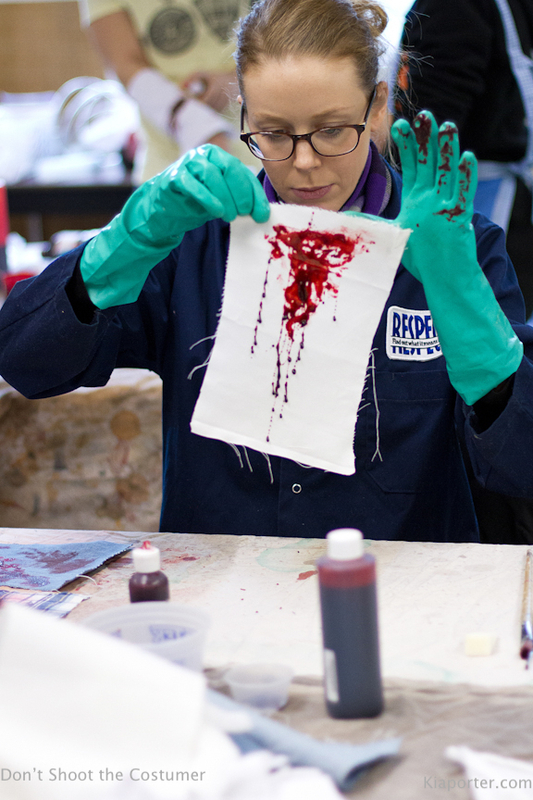 This doesn’t always mean that the blood they’re using is going to work for me… some of the washable bloods used by the Makeup Department don’t always work with the costumes… but it’s good to try different products and see how they will react with fabrics. But in reality, even on the biggest shows, you won’t have all the products available to you, so the real challenge is how to take what you have on hand and create what you need! With this one small bag you’re ready to go. One bottle of bright blood; leave it plain or tint it with the Bluing to take it anywhere from a touch darker to alien black! Add some toothpaste to thicken it and throw in some coffee, tea or cotton to gum it up. Wound in a bag! Have fun getting sticky today!! This entry was posted in Enkindle, Shutterbug, The whole Sheblog! and tagged actors, artists, Blood, Capilano University, Condom, costume, costumer, courage, designers, director, education, film, first assistant director, flim blood, IATSE, James Cameron, kiaporter.com, learning, movie, movies, Mrs. Stewarts Bluing, Saskatchewan, school, schooling, skills, SMPIA, Two Brothers a Girl and a Gun by dontshootthecostumer. Bookmark the permalink. Thanks! It’s was so much fun having you there! Great! If you need any other suggestion just send me a note!! Have fun out there! Good article on Blood – very informative, thanks. I would love to take your class!!! I can do blood, but I don’t know all of those cool tricks!!! I do another me next year at cap. However if I could find some where I would happily put a class on for all who were interested! Humm let’s talk about it! Thank you! It is always great to hear from people who find my blog, I love that it is making a difference. If you have any questions please send me an email and I will help in any way I can.